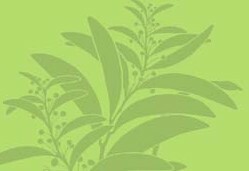 Description: Herbs, shrubs or small trees, often with very tough bark. Leaves mostly opposite or subopposite, usually paler on lower surface; petiole commonly very short. Inflorescence mostly a terminal raceme, sometimes on short lateral branches, spike-like, often condensed into heads or clusters, with or without bracts forming an involucre. 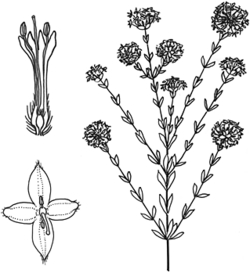 Flowers mostly bisexual, sometimes unisexual; pedicel usually short. Hypanthium tubular with 4 usually spreading sepal lobes. Petals absent. Stamens 2, inserted in the hypanthium and mostly exceeding it. Ovary with 2 carpels, but only 1 functional with a solitary ovule; style lateral. Fruit mostly a 1-seeded nut or rarely drupaceous; fruit usually ± narrow-ovoid, frequently glabrous except for a few hairs at the apex, mostly green or brown at maturity, sometimes red, rarely black. Distribution and occurrence: World: c. 108 species, Australia, New Zealand. Australia: c. 90 species (endemic), all States. Some species are known to be toxic to stock, and others are suspected of being so. Known toxic species include P. curviflora, P. flava, P. glauca, P. linifolia, P. microcephala, P. neo-anglica, P. pauciflora, P. simplex and P. trichostachya. P. petrophila F. Muell. has been recorded in the Barrier Range (NFWP). This species is very similar to P. flava but differs in the narrower bracts and the pitted (not furrowed) seeds. Key based on Threlfall (1983).